A graduate of the University of Michigan and the College of Financial Planning, George Robertson began his financial services career in 1986. Through the years he's earned the designations of CERTIFIED FINANCIAL PLANNER™ practitioner, Accredited Investment Fiduciary (AIF™) and Chartered Retirement Plans Specialist (CRPS). As a member of the Financial Planning Association (FPA), George encourages his fellow members to maintain the highest ethical standards. See George's FINRA BrokerCheck to review his investment professional background. For George Robertson, providing trust management is more than a matter of professional pride. It's how he serves his family legacy. As trustee and portfolio manager of his family's private foundation, he's built on the assets left by his father and grandfather - distributing substantial sums to charitable organizations along the way. 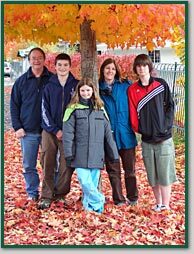 George lives in Covington, a little south of Issaquah, with his wife Mary and their three children Chris, Reuben and Anne. Some of his hobbies include photography, cross-country skiing, camping, and hunting and fishing. George's interest and love for aquatic life began as a youth, continued through college, and has led him to his current involvement with non-profit projects like Marine Science Afloat, and other worthwhile projects that foster appreciation for the marine ecosystem of Puget Sound. He is a volunteer Board Member of Pacific Marine Research.